In addition to paying attention to what we eat to help us lose weight, it's important to focus on how much we eat. Today, most portion sizes considered normal actually contain much more food than you need. "Now I am more conscious about portions when I'm eating. I love pizza just like anybody else, but you can't down a whole pizza, and you can't do it on a daily basis." Look at this plate. It might be considered a normal meal at home or in a restaurant. However, it has very large portions of meat and potato with very little vegetables. 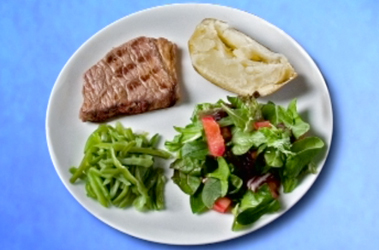 A healthier meal would contain smaller portions of the high calorie meat and potatoes. For meat, the serving size is about the size and thickness of a deck of playing cards. If this meat portion seems small compared to your normal portion, cutting back a bit at a time will help. The serving size of a potato is about the size of a computer mouse. In addition, add more nutrient rich low calorie vegetables to balance out this meal. One of the best tools you can use when practicing portion control is the nutrition facts label that's on almost all packaged foods. It has what a serving size is, and how many calories are in that serving. To do your own detective work for fresh foods, a scale, measuring cups and spoons, and a calorie-counting book are all you need. Be mindful of how much you're eating. Distractions can lead to you eat more than you intend to, and often lead to overeating. Turn off the TV. Enjoy a family dinner together or quiet time to yourself. This will help you enjoy the meal. Eat slowly, and when you are no longer hungry, stop. You might be surprised at how little food it takes to satisfy your hunger. "Everybody likes to use food for celebration and occasionally for a reward, and there is nothing wrong with that. It's when it's habitual or eating mindlessly, and really we let other people feed us, without any idea of what's a good portion for us." Now you don't have to say goodbye to everything you love. Just don't eat as big a piece or as many servings of that food. If you've been served a meal that is larger than one portion, split it with a friend, or take half of it home for later. Managing portion size is an important part of long-term, permanent weight loss success.